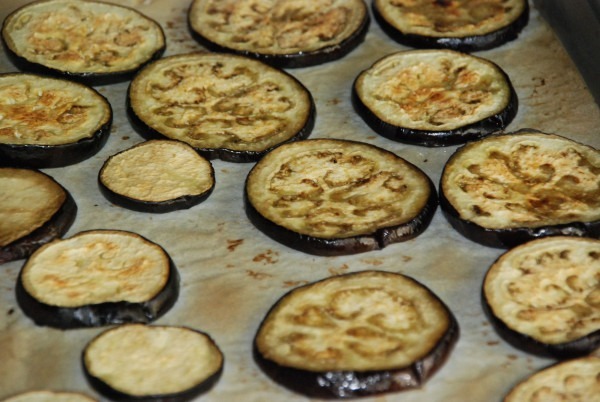 Line 2 baking sheets with parchment paper and spread the eggplant, zucchini and squash out in a single layer on sheets. In a large nonstick skillet heat oil on medium for 1 minute. Add onion and cook, stirring frequently for 5 minutes. Remove from heat and stir in cottage cheese and oregano. Lightly coat an 11x7 inch baking dish with extra virgin olive oil. Line bottom of dish with zucchini and squash, using all rounds and overlapping them so dish is completely covered. Top with cottage cheese mixture. Arrange eggplant over cottage cheese in overlapping rows and top with mozzarella. Bake at 375 degrees for 30 minutes or until cheese is golden and bubbling. Serve immediately.